I bought this cask strength bottle of Linkwood from the Whisky Broker in May 2015. Since then it’s provided several enjoyable sipping sessions. At 26-years-old it’s a mature Speysider but with plenty of fruity freshness. Only 288 bottles were produced from cask no.1828 and at 53.1% it packs a potent punch. It appeared in the Whisky Bible 2016 where the author, Jim Murray says “malty, sharp and, at times, searingly hot. Sparse and off key on the finish, also.” His score of 83/100 classifies this Linkwood as “good whisky worth trying”. For me my score would sit between the Whisky Bible and Whiskybase at 86/100. It’s an excellent whisky but I’ve tasted better cask strength Linkwoods. But it’s worth buying at auction if you see it going for less than £100 and you enjoy the Linkwood profile. This is a very good example. Nose: Pear Drops, Wine Gums, Ripe Strawberries, a slightly spirity nose but not unpleasant. After about 30 minutes and a drop of water – some lemon and still the acid pear drops. Very big and slow legs. Taste: Acid pear drops. Fresh and sweet with some pepper. Wine Gums. A hint of licquorice and some lemon. Finish: A dry finish. Lingering acid drops and lemon with a pepper after taste. Most pleasant. 84/100 on Whiskybase is a very good score. It may only be from one member but it is backed up by reviews elsewhere such as 4/5 from Philip Storry (his review here) and A+ on Ben’s Whisky Blog, which comes with a “highly recommended”. With the title of ‘Back to Primary School’ this dram brings back childhood memories of “lime Opal Fruits and drumstick lollies”, “orange barley sugar squash”, “lemon sherbet” and lashings of ice cream in various forms. This single malt may only be 9 years old but it has drawn out a lot from the first fill bourbon barrels and cracks a whip at a feisty 60.3%. Drinking tip: A bit of a garden party dram – lazy, laid-back summer time fun. As someone who loves Linkwood, I’m wondering why it’s taken me this long to get the standard 12yo released by the Diageo-owned distillery. It gets a fantastic score of 94.5/100 in the Whisky Bible where the author says of the taste “a quite stunning delivery with some of the clearest, cleanest, most crystalline malt on the market. The sugars are angular and decidedly Demerara.” And summarises with “possibly the most improved distillery bottling in recent times. Having gone through a period of dreadful casks, it appears to have come through to the other side very much on top and close to how some of us remember it a quarter of a century ago. Sublime malt: one of the most glittering gems in the Diageo crown.” 94.5/100 classifies this malt as a “superstar whisky that gives us all a reason to live”. I believe Diageo now own 27 single malt distilleries and 2 grain distilleries so they have quite a grip on the whisky market. My Linkwood is part of the ‘Flora and Fauna’ series, which you can sometimes see at auction as 26 bottles from 26 of Diageo’s distilleries. One such collection recently appeared on Whisky Auctioneer where a final bid of £3,750 failed to meet the reserve. The lot was described as “The Flora and Fauna series of whiskies was originally created in the early 1990s by United Distillers Vintners (what would later become Diageo). Originally this range had no name and it was not until the famous whisky writer Michael Jackson nicknamed it the ‘Flora and Fauna’ series due to the labels, did it stick. The Flora and Fauna series, as offered in this lot, contains a total of 26 distillery expressions. Not all of these were released at the same time and many have now been discontinued”. The crazy thing is that £3,750 is £144 per bottle where most bottles were only about £50-£60. Admittedly most have been discontinued but my Linkwood hasn’t and that was only £50. Two of the 26 distilleries are now closed, the Rosebank and Pittyvaich but they shouldn’t push the average bottle price up so high. One collection sold for £4,900! But I suppose it’s a complete series and that’s what people are paying for. 82.5/100 on Whiskybase is an above-average score with several members describing it as a nice summer dram. One taster summarises with “it’s a young and vibrant single malt with a surprising vegetal twist. The Linkwood expressions I tasted so far where all pretty sherry influenced so this is a nice change.” Another member adds “light and fragrant. Complex”. None as yet and still not listed on Whiskybase. I’ll add the link when/if it apears. Whisky Broker must be one of the few remaining UK independent bottlers that still give excellent value. One area where they impress me the most is with their pricing of miniatures. No matter how old the whisky, be it a 12yo or 24yo, a 5cl is always £6.50. How long this policy will last I don’t know but I’ll take advantage of it for as long as I can. The next time they have another tempting 70cl I’ll add a few more of their cheap minis to my order. I already have a Linkwood 12yo miniature by Gordon & MacPhail but that’s 40% as opposed to 59.8% for this cask strength version by Whisky Broker. Perhaps the most common Linkwood 12yo is the distillery release by Diageo under the series name ‘Flora & Fauna’ which scores a cracking 94.5/100 in the Whisky Bible 2016. I recently spotted a bottle in a local off license, which begs the question – what am I waiting for? Buy it! With my Linkwood addiction it seems an obvious choice. My second bottle since joining the ‘Scotch Malt Whisky Society’ (SMWS) is this Linkwood entitled ‘Builders at Breaktime’. Not the sort of image I’d associate with good flavour but the description of the bottle goes on to say “chips wrapped in warm newspaper and meaty broth tangled with oily engines. Dough balls with dark chocolate, espresso and cinnamon sprinkles. A cheeky tequila with salt and lime. Twiggy crisps, peanut brittle and garibaldi biscuits. Tools down for the day!” OK so it wasn’t the builders that the title was alluding to but what they might be consuming during their break. Tasty! In Ralfy’s video below where he discusses the SMWS and reviews one of their bottles, someone comments about how expensive the SMWS bottles are when compared to distillery releases. They mention a SMWS bottle of Ardbeg. In a lot of cases you can’t get cask strength distillery releases but you certainly can for Ardbeg. What you rarely get from Ardbeg is age statements that are cask strength (the 10yo is 46% and the hugely expensive 17yo is only 40%). So it’s difficult to compare SMWS directly with most distillery bottlings. What makes more sense is to compare with other independent bottlers. This 14yo Linkwood (58%) cost £48.10 with free postage. I could buy a 15yo Linkwood (55.8%) from Bartels Whisky for £55.80 but I’d still have to add £3.95 postage. Admittedly you pay £130 to join the SMWS society but it gives you free delivery for a year. If you buy 10 bottles in that time then you’ve made your money back compared to Bartels Whisky (who I would say are one of the cheapest independents). I’m not saying the SMWS are cheap but they’ve clearly done their pricing research and charge appropriately. I’m a big fan of the independent bottler ‘Bartels Whisky’ (formerly ‘Malts of Scotland’). I’ve bought from them several times and the customer service is second to none. There have been a few glitches but every time I’ve contacted them they’ve bent over backwards to make things right. Getting this Linkwood was pure luck. They’d run out of the item I ordered but offered me a choice between a Fettercairn 22yo, Benriach 18yo or a Linkwood 14yo. These were only available to retailers so didn’t appear on Bartels Whisky’s website. Although the ancient Fettercairn seemed the best value, reviews weren’t favourable. My head said Benriach, which I knew would be an excellent dram but my heart said Linkwood, so that’s what I got. Whichever I picked it was only going to cost £47, which is what I’d already paid for the Deanston that was out of stock. 83.67/100 on Whiskybase is a very good mark although not all the comments are favourable. One reviewer remarks “nice but uneventful by Linkwood standards” but a more positive voter says “if you like the fresh, mellow, floral, summery flavour profile, you will like this. I know I do. I seem to be a bit above the average rating here (88/100), but this really suits me.” And as a fan of the Linkwood profile I’m sure I’m going to enjoy this Speyside dram. 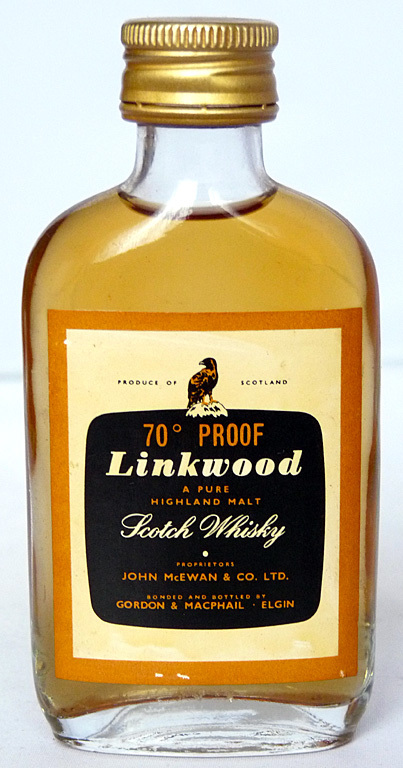 In December 2014 a full 75cl bottle of this Linkwood from the 1970s sold at auction for £87.50. That’s not a bad price for something scoring nearly 89/100 on Whiskybase. I’m going to have to drink this and find out if I agree with all the good comments! Sometimes you get lucky at an auction. I thought I was bidding on the 40% version of this old Linkwood 15yo by Gordon & MacPhail (G&M). When the package arrived in the post I discovered it was the 57% version (100 Proof). The auction house forgot to include this in the description, which explains why I got it for so little (£3.25). A full 75cl bottle sold at auction 3 months earlier for £125. A 5cl share of that bottle equates to £8.33. I was a happy man, even without a drink in my hand! 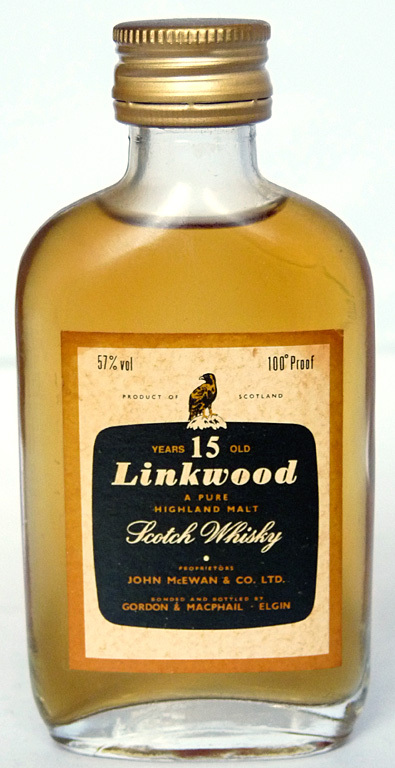 According to Malt Maniacs this version of Linkwood was first produced by G&M in c.1988. At this point my brain always subtracts the age of the whisky, so my dram could have been distilled as early as 1973. Although I’ve been unable to find any written reviews, both the scores on Whiskybase and Malt Maniacs suggest a quality whisky. I could put it back into an auction and double my money or drink it. Hmmm, I think a taster is too tempting!